Neil Armstrong, as portrayed in the movie "First Man" by actor Ryan Gosling, left something of his behind on the moon. Did he do so in real life too? Only a future mission to the moon might be able to tell. Sometime in perhaps the not too distant future, a robotic rover, or maybe even an astronaut, will visit a small crater on the moon to answer a mystery inspired by the movie "First Man." Spoiler warning: What follows reveals a major detail from Damien Chazelle's film starring Ryan Gosling as Apollo 11 moonwalker Neil Armstrong. If you have not yet seen "First Man," you may want to bookmark this article and return to it later. In one of the final scenes of "First Man," Armstrong (Gosling) is shown standing alone at the edge of Little West crater, where he lets fall a beaded name bracelet. The keepsake belonged to his daughter Karen, who is revealed earlier in the movie to have died of brain cancer at the age of two. 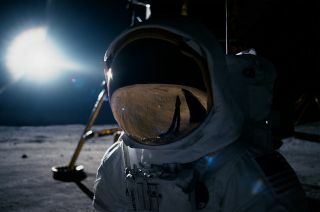 The scene underscores the overall theme of loss that "First Man" suggests followed Armstrong throughout his career as an astronaut, all the way to the lunar surface. "I think it would be unreasonable to assume that it would have no effect," Gosling, as Armstrong, says, replying to a question about Karen's death during the movie's depiction of Armstrong's astronaut selection interview. In reality, we really do not know what effect it had. In the film, as in real life, Neil Armstrong did not mention Karen after she died, as his sons, Rick and Mark, told collectSPACE.com in an interview. "He never talked to us [about her]," said Rick Armstrong. We do know that Armstrong took an unplanned trip out to Little West crater towards the end of his and Buzz Aldrin's two-and-half-hour Apollo 11 moonwalk on July 20, 1969. During his three minute jog out to the crater and back, Armstrong was out of contact with both Aldrin and Mission Control, and other than taking a series of nine photographs of the crater, there is no record of what else, if anything, he did while out there. "When I went over to look at the crater, that was something that wasn't on the plan, but I didn't know the crater was going to be there. I thought seeing and photographing it was a worthwhile addition," Armstrong said in an interview with historian James (Jim) Hansen for his 2005 authorized biography, "First Man: The Life of Neil A. Armstrong" (the book was the basis for the movie). Armstrong, like his crewmates, had the opportunity to fly mementos to the moon. Each of the astronauts had a Personal Preference Kit (PPK), a small pouch in which they packed medallions, stamped envelopes, mission patches and other small souvenirs. Armstrong, Aldrin and Michael Collins (who stayed in lunar orbit) each flew a gold olive branch broach for their wives. Armstrong did not, however, fly anything for his sons. Little West crater, located near Tranquility Base, as photographed by Apollo 11 moonwalker Neil Armstrong in July 1969. "In our household, in our upbringings, there really was never any discussion about things that were taken. It was just something that never came up," said Mark Armstrong. "It wasn't part of the engineering problem, and my interpretation would be that he was a lot more focused on the engineering problems than keepsakes." Armstrong and Aldrin did bring a small pouch of mementos to leave on the moon, including a small silicon disc etched with goodwill messages from world leaders, a couple of medallions to honor fallen Soviet cosmonauts, a mission patch for the ill-fated Apollo 1 crew and another of the gold olive branches. But that was treated almost like an afterthought, unceremoniously dropped onto the lunar surface and even kicked a bit at the very end of the moonwalk. Astronauts on later missions would leave a family photo on the moon and write a daughter's initials in the lunar soil, but did Armstrong, contrary to his other actions, leave something behind of Karen's? "If he did, he didn't tell us," said Mark. "It was a private thing, and I think that's the way the movie portrays it." "But he did go over to that crater," said Rick. "And we don't know what he did over there," said Mark with a laugh. So where did the idea come from to show the bracelet falling into the 13-foot-deep (4-meter) crater in "First Man"? "The bracelet is conjecture, but it is not my conjecture, it is Jim's conjecture based on all of his research," said screenwriter Josh Singer. "I talked to Neil about whether he took anything for his family and specifically for Karen to the lunar surface," said Hansen. "I talked to his wife Janet and I talked to his sister June about it, and there's no evidence that he did." "When I asked Neil point blank whether he took anything for Karen, he did tell me that he did not," Hansen continued. "I never questioned the honesty of his answer, but Neil was such a private man, I think if there were things private to him, that this would be maybe the most private." June Armstrong Hoffman, in her interview with Hansen, did not know what her brother flew, but when asked if he might have flown something for Karen, replied, "Oh, I dearly hope so." Karen Armstrong, portrayed by Lucy Stafford, is seen wearing her beaded name bracelet while sleeping as her father (Ryan Gosling) gently strokes her hair in a scene from "First Man." "It was the few lines in Jim's book where he asks June, Neil's sister, whether she thought that he might have brought something of Karen's to the moon that triggered the idea," said Damien Chazelle in an interview with collectSPACE.com. "I became fascinated learning about the few minutes Neil spent at Little West crater on his own," Chazelle continued. "I think the idea of something very private happening on the moon that no one would know about just seemed very beautiful to me. The Apollo 11 moonwalk is one of the most famous events in human history, and trying to invest that with something as personal and private as possible felt like it could be a way of making one of the biggest moments in history also one of the smallest, one of the most intimate, and that was what we wanted to do with the movie as a whole." Ultimately, with Armstrong's death in 2012, no one can answer definitively if he left something on the moon for Karen, whether it be a bracelet or another small item. It may be that only a future mission to the moon will be able to confirm if the scene in "First Man" is mostly fact or fiction. "Maybe this is really the bottom line for us in terms of the movie, and that is there are times when the power of poetry prevails over the uncertainty of fact," said Hansen. "I think this, for me, and I think for the filmmakers too, this might be one of those occasions." But should a rover or astronaut find themselves near Little West crater, maybe go have a peek, said Chazelle. "I would love that," he said. "It would be like 'Well, it's not a bracelet, it's a rubber ducky. But, you know, otherwise…'"
Click through to collectSPACE to see one of the prop bracelets created for "First Man."